The incumbent shall be capital of performing fundamental research, research for financial product designing, other research related to financial markets, business and economic research. Masters Degree (MBA/MBS/Finance/ any other related field) from a recognized Institution with at least 2 years of relevant work experience. Knowledge on technical analysis will be an additional advantage. 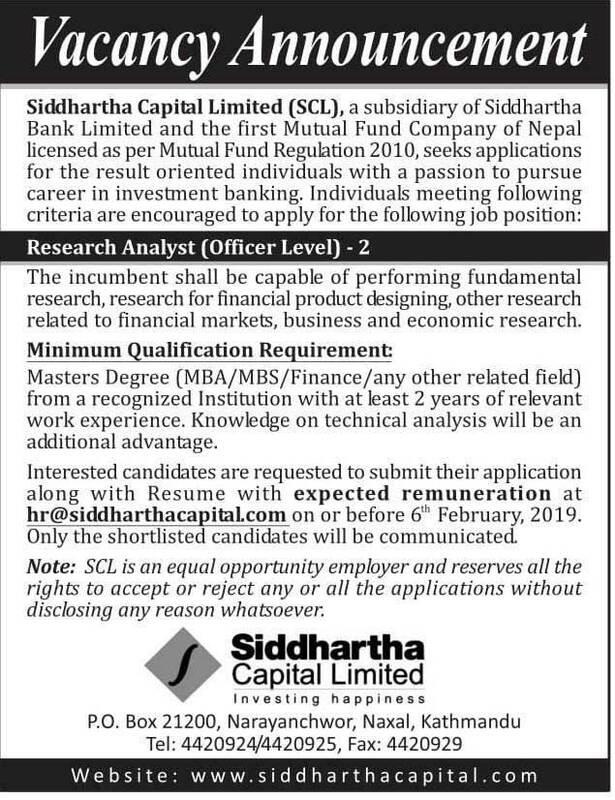 Interested candidates are requested to submit their application along with Resume with expected remuneration at hr@siddharthacapital.com on or before 6th February, 2019. Only short listed candidates will be communicated. Note: SCL is an equal opportunity employer and reserves all the rights to accept or reject any or all the applications without disclosing any reason whatsoever.